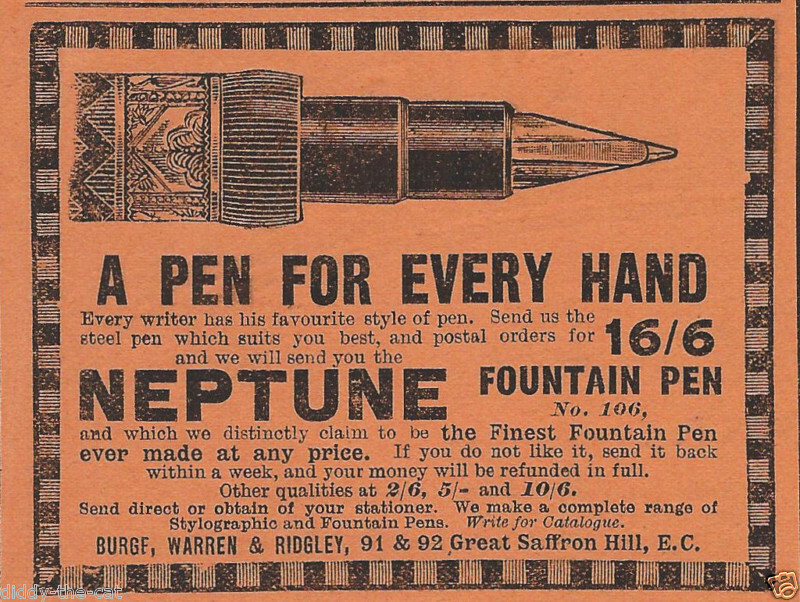 An early advertisement circa 1905 for the Neptune "Twin Feed" fountain pen detailing the prices for the different versions, the gold mounted coming with a leather case.The book shows many examples of these splendid pens and their luxurious presentation cases. This advertisement shows that Burge Warren & Ridgley didn't just make fountain pens out of vulcanised hard rubber or "Ebonite" as it is referred to in their Ad. This Advertisement dates from the late twenties or early thirties and the prevailing poor economic climate might be the imperative behind their offer. The phone number is a reminder of the days when phones were few .